Have you spent some time just laying around in your pj’s? Maybe reading a good book, or playing cards with your kids? I have a great, very easy appetizer recipe for you today. to hang around you for “years”? I am often plagued with dumbness. Once I clapped really loud after a prayer. Must of been some prayer. My friend Tricia doesn’t mind my dumbness. and laughing at my jokes. She’s a keeper that girl. I’m hoping she’ll keep me for years and years to come. 1. Into a medium sized mixing bowl place 1 cup mayonnaise. 2. Grate 2 cups of Monterey Jack cheese and add it to the bowl. 3. Drain the liquid from the can of chilis and add it to the bowl. 4. Toss in 1 1/2 cups Parmesan cheese. 5. Drain the liquid from the artichoke jar and pour the artichokes out on a cutting board. Chop them up and add them to the mixing bowl. and pour the mixture into it. 7. Bake uncovered, at 325 degrees for 25 minutes. 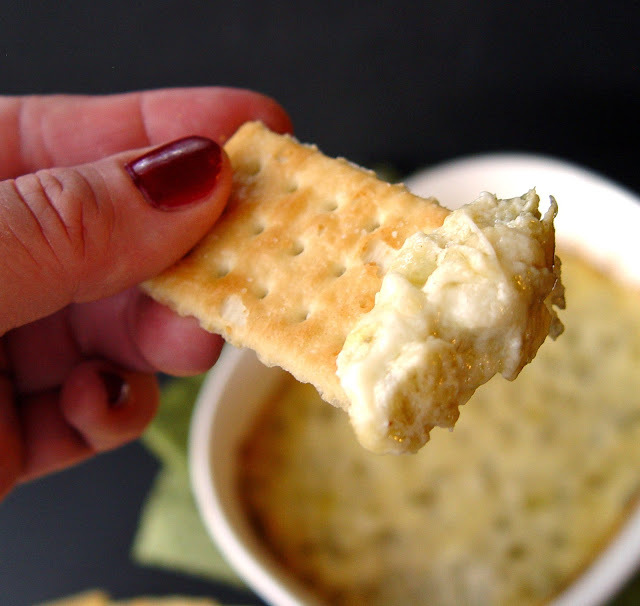 Serve while still warm from the oven with buttery club crackers. I made this last year, and it was loved by all, so delicious. THANK YOU Jamie for this AMAZING recipe!!! 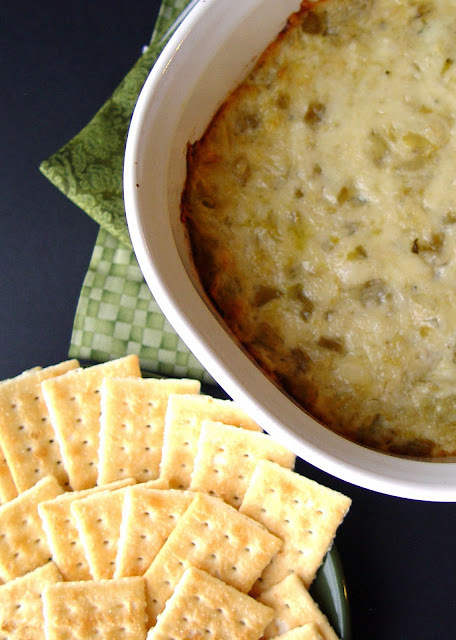 This is the BEST dip I have EVER made!!! Thnak you again for ALL of your WONDERFUL recipes! This also tastes great with toasted baguette bread. I will keep you for years and years Jamie. You are awesome!!!!! I like to add a fresh roma tomato to mine for a punch of color! Great Recipe! My family really enjoys your recipes! All I have right now is the parm in the green container – do you think it will alter the outcome much if I use it instead of grated parm? I haven’t ever tried the processed parmasan for this recipe. My first thought is that it wouldn’t work out super well, because it doesn’t melt. Good luck! Love your blog, Jamie! This looks like a great recipe. I make a similar one that came from a friend. 14oz can artichoke hearts, drained, 8 oz softened cream cheese, 1 cup shredded Parmesan (I have used the green bottle in a pinch), 1/2C sour cream, 1/2C mayo, 1t garlic powder, 1 T. jalapeno, seeded and finely diced, 1/2C plus 2T plain unsweetened yogurt, 7 oz mozzarella, 1T seasoned salt. Mix together well, bake 35-40 min at 325 until lightly browned on top. We use cut up bagels to dip. I don’t like jalapeno, so I usually leave them out. I was wondering if you could mix everything together, then freeze. Thaw and bake when needed? Thanks– going to make the rolls in this post tomorrow! I haven’t ever tried to freeze it before, however my first thought is that it wouldn’t turn out very well. Often things with a cream base, don’t.